There have been many occupants of the Oval Office in the White House that have possessed of brilliant minds and some not so brilliant. When it comes to the latter, think of both Presidents Bush as prime examples. Bush Senior, i.e. George H.W. Bush, even gave rise to a neologism for gaffes – Bushisms. Below is an example. It’s no exaggeration to say the undecideds could go one way or another. The lack of intellectual firepower must be hereditary. “Dubya”, as the 43rd president was affectionately known, seems to have inherited his father’s legendary language skills, as per the following example, uttered in Bentonville, Arkansas, on 6th November 2000. For masochists, there’s plenty of Dubya gaffes out there. Coming right up to date, many would concede the 45th President of the United States of America was not at the front of the queue (or line for Transatlantic readers) when brains were being handed out. His mental stability has even been called into question. The Donald is well known for his irrational outbursts and prolific use of social media, sometimes combining both, as in this tweet from a few days ago. Let’s just analyse that tweet a bit and before we begin, it’s worth remembering insisting that global warming is a “hoax” invented by the Chinese, not to mention his appointment of climate change sceptics/deniers to both his cabinet and the Environmental Protection Agency. “Climate change” and “global warming” are often used interchangeably but have distinct meanings. Similarly, the terms “weather” and “climate” are sometimes confused, though they refer to events with broadly different spatial- and timescales. This is exactly what Trump has done, not only confused climate change and global warming but weather and climate too. Weather refers to atmospheric conditions that occur locally over short periods of time—from minutes to hours or days. Familiar examples include rain, snow, clouds, winds, floods or thunderstorms. Remember, weather is local and short-term. Climate, on the other hand, refers to the long-term regional or even global average of temperature, humidity and rainfall patterns over seasons, years or decades. Remember, climate is global and long-term. Referring to “good old Global Warming“, this is POTUS getting down with his supporters denoting someone something – in this case global warming – that will do what is wanted or expected of them or it respectively. As for shouting about “trillions of dollars”, remember that climate change denier Trump has pulled the USA out of the Paris Agreement. Donald has received plenty of criticism from many quarters for the above tweet. One of the most interesting implies that Trump is being hypocritical. The Hill reports that celebrity chef José Andrés has more or less accused Trump of hypocrisy. Why are you trying to build a wall in Ireland to protect your Golf club from raising seas?…..Mr. Trump just we had one of the bigger seasons of hurricanes in a century! People in USA are without homes, food and electricity because of Global warming!!! Really? Andrés was originally going to be opening a restaurant in a Trump establishment in Washington, D.C., but pulled out after Trump made racist remarks about Mexicans during his presidential campaign. Trump sued then Andrés for breach of contract; the chef countersued. Although a settlement was reached earlier this year, Andrés has continued to criticise Trump, particularly in respect of the response to Hurricane Maria’s devastation of Puerto Rico and Trump’s attitude to Moslems. 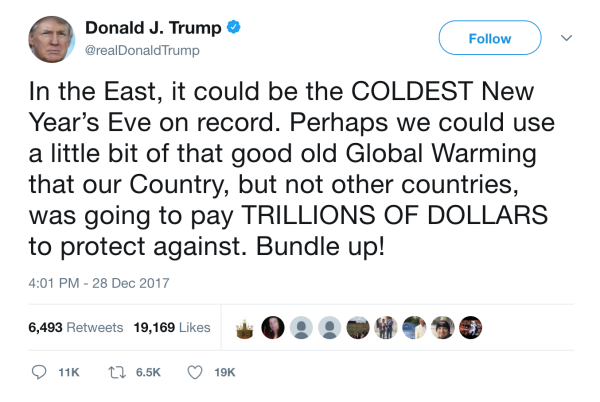 Even given some stiff competition from the Bush family, Trump’s global warming tweet is in my mind the dumbest thing to come out of the Oval Office since the days of Ronald Reagan, who, incidentally, was out-acted by a chimpanzee in Bedtime for Bonzo in 1951. This entry was posted by Steve Woods on December 30, 2017 at 14:04, and is filed under Language, Politics, Social Media. Follow any responses to this post through RSS 2.0. Both comments and pings are currently closed.